Three years after Sandy caused $50 billion in damage as the powerful storm ripped up beaches along the New York and New Jersey coasts, flooded shops and homes and left lower Manhattan dark for days, “resiliency” has become the byword of the region. New York City alone is spending $20 billion to try to make sure that the five boroughs better withstand the severe storms that scientists say climate change will make more likely. But some experts say the area should be bolder, with one proposal calling for a storm barrier that stretches across the entrance to New York Harbor. Resiliency is an admission that damage from storms such as Sandy will keep happening, said Malcolm Bowman, an oceanography professor at Stony Brook University on Long Island. “I think resilience is fine but it’s not enough,” he said. “What we need is protection." As part of its climate resiliency plan, New York City is replenishing sand on beaches in Coney Island and the Rockaways, adding dunes along the coast and restoring wetlands. It will construct new levees to protect the city’s food supply at the Hunts Point wholesale produce, fish and meat markets and test whether it can build a series of berms around the bottom of Manhattan to keep out of the water. This week, to mark Thursday's anniversary of the storm’s landfall, Mayor Bill de Blasio visited a house that had been rebuilt 15 feet off the ground in Breezy Point, Queens. When he took office in 2014, the city’s Build It Back program had not seen any construction starts, he said. Not a single family had received a reimbursement check. He said that number was now 1,877. Thursday marks three years since Sandy hit, and some families are struggling to rebuild with limited insurance money. Greg Cergol gives us a look at the progress in Freeport, Long Island, where victims have had to seek out alternative means to rebuild. “For years to come, we’re going to be constantly working on resiliency,” he said. Congress approved $60 billion in aid after Sandy struck. Since then, the Federal Emergency Management Agency and the U.S. Small Business Administration have disbursed nearly $16.9 billion for New York’s recovery. FEMA has provided $6.8 billion to New Jersey. Michael Grimm, an assistant administrator for mitigation for FEMA, said the federal government was increasing resilience through building standards required by the National Flood Insurance Program and codes recommended after storms like Sandy. Plus, three grant programs provide money for hazard mitigation, flood mitigation and pre-disaster mitigation, he said. More than $1 billion is available in New York alone for hazard mitigation, in which homes that have been damaged can be bought or rebuilt to greater standards. The pre-disaster mitigation grants allow for buyouts or school building improvements of waste water treatment plants retrofits ahead of time. The program is now funded at only $25 million for the country, but President Obama has requested $200 million for the coming fiscal year, with a focus on climate resilient mitigation projects, he said. Bowman, with Stony Brook, said the storm barrier he has been promoting would stretch five miles across the entrance to New York Harbor from Sandy Hook, New Jersey, to Far Rockaway, Queens. The water there is only 20 to 25 feet deep, except for shipping lanes in the 65-foot deep Ambrose Channel. A second smaller barrier would be needed in the upper East River, he said. "To build a wall or barrier, even though it's five miles, is not that difficult," he said. The price, $35 billion for a barrier alone, would be cheaper than the cost of Sandy’s damage, he said. The barrier between Sandy Hook and Far Rockaway could also function as a toll road that would help pay for the cost and act as a bypass for traffic coming up the East Coast to John F. Kennedy International Airport and Long Island. Marinas could line the protected inner side. Robert Freudenberg, the director of energy and environmental programs at the Regional Plan Association, said that New York and New Jersey were in better shape to withstand fierce storms, but are not fully prepared. Too many people would still be at risk. “Essentially we’re racing the clock on that,” he said. New York City has revised its flood maps so that they are more accurate. Going forward, the city should consider how many people it wants living in flood areas, he said. The Metropolitan Transportation Authority has done a good job at fortifying subway tracks and tunnels that flooded during Sandy, he said. New Jersey transit is building a micro-grid so that it can keep electric trains running. Utility company Con Edison is constructing seawalls and raising infrastructure so that the next big storm does not leave lower Manhattan without power again. A competition called Rebuild by Design sparked exciting ideas, among them the plan for earthen mounds to keep water out of lower Manhattan while also creating new parkland, he said. “It smartly brought innovation and design to the concept of resilience and storm protection,” he said. But Freudenberg said the area needs to learn to live with water, through canals for example, rather than focus only on keeping it out. It should look to places such as the Netherlands or New Orleans. Robert Young, the director of the program for the study of developed shorelines at Western Carolina University in Cullowhee, North Carolina, said that he did not think conditions along the coast were better than before Sandy. Communities should be making make tough decisions about what they are trying to protect, he said. Two families victimized by Sandy became the last to move back into their Belmar, New Jersey homes Monday, three years to the week after the storm turned them into refugees. Brian Thompson has more. “The Army Corps of Engineers is trying to build one giant dune from Delaware to Connecticut,” Young said. He questioned how much money federal money should be spent in vulnerable areas, whether rebuilding oceanfront houses that are rented out in the summer or safe-guarding low lying roads such as the Robert Moses Causeway connecting Jones Beach and the western tip of Fire Island. While the need to secure places such as Manhattan's Financial District might be obvious, others are not. The country should be developing a map of what areas are priorities, he said. 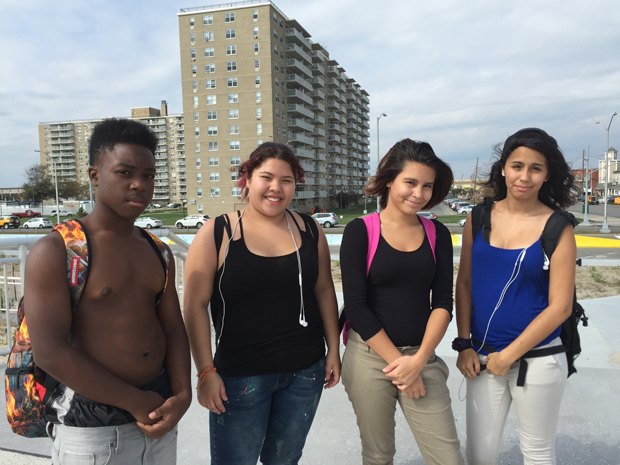 Devon Williams, 14, Destiny Gonzalez, 15, Unity Felix, 14, and Crystal Pabon, 16, head to the new boardwalk in Rockaway Beach after school. They thought the boardwalk would withstand another storm but were doubtful about the sand. At Rockaway Beach, a rebuilt boardwalk is protected by a sand retaining wall, sand underneath and dune plantings. Gabriel Taussig, a 66-year-old retired lawyer who worked for New York City and who was visiting Rockaway Beach earlier this month, said it would be difficult for people to abandon their homes. The new boardwalk was built with another Sandy in mind, he said. Barbara Lev, 63, said that although New York City had taken too long to rebuild in the Rockaways, she thought the new boardwalk might stand up to another storm. 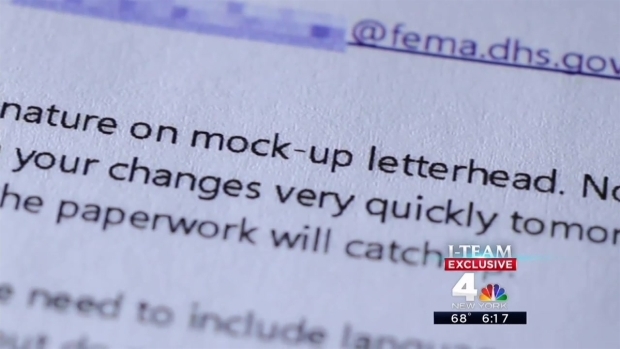 Emails authored by FEMA say the head of New York City’s public hospitals proposed to "head off" a critical I-Team news report by signing a "mocked-up" agreement on Sandy disaster aid before the federal government was ready to commit. Chris Glorioso has the bizarre details in this I-Team report. Lev, an administrator for the NYPD's transit bureau, said rock jetties could help keep sand in place. Dunes on their own will be blown away, she said, but she disagreed that federal money should not be spent rebuilding the beach. Young said that continuing to pump sand onto beaches was a just temporary fix, a storm buffer for oceanfront houses that will last only until the next storms, he said. “Wait a few years when we’ve had a couple of nor'easters and coastal erosion has continued and everything’s going to look like it did before Sandy again and the coast is going to be more vulnerable,” he said.